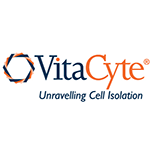 VitaCyte LLC manufactures highly purified and rigorously characterized tissue dissociating enzymes, sold as individual enzyme products or as enzyme formulations for specific cell isolation applications. The enzyme formulations are designed to achieve high viable cell yield, very low contaminant levels, and lot-to-lot consistency. Our focus is on delivering a product designed specifically for your application when isolating human or other mammalian cells from tissue for use in research or clinical applications. As knowledge advances in cell isolation science, VitaCyte is here to provide you technical support and deliver the purified tissue dissociation enzymes you require to maximize the yield of functional cells. VitaCyte's defined enriched (DE) collagenase products set a new standard of consistency and enables assessment of a broader range of collagenase:protease ratios for cell isolation than found with current collagenase products. Each DE product contains a fixed amount of protease activity1 and increasing amounts of collagenase activity2, simplifying collagenase selection and minimizing the need for lot qualification. See the brochure below for complete details.